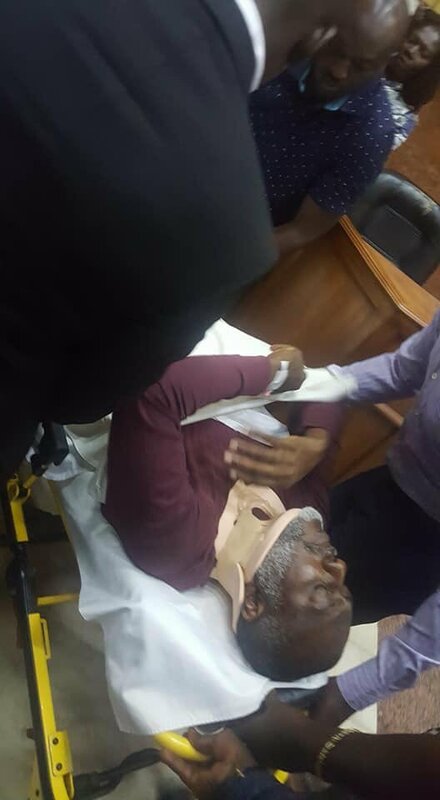 Former National Publicity Secretary of the Peoples Democratic Party (PDP), Olisa Metuh has appeared in court on a stretcher. Mr Metuh is standing trial for alleged money laundering being part of the funds linked with former National Security Adviser, Colonel Sambo Dasuki (rtd). His lawyer, Emeka Etiaba, had informed the court in January that his client was on admission at the Nnamdi Azikiwe University Teaching Hospital for an undisclosed ailment. The former PDP spokesman was, however, wheeled to the court on Monday following the threat by Justice Okon Abang to revoke his bail if he fails to appear in court today. Lead counsel in the case, Dr Onyechi Ikpeazu, informed the court that attempts to get Metuh’s doctor to give a timeframe for which he would be released from hospital proved abortive. He, however, made a case for his client to be given a one-month adjournment as he was hopeful that Metuh should be fit to continue with his trial within the period. Ikpeazu explained further that one month was a reasonable period for the doctors to carry out a valuable and reasonable assessment of his client. In his ruling, Justice Okon Abang said he has seen that the former PDP spokesman in a state in which he cannot continue with the trial. “On account of the condition I have seen him in the courtroom,” he said. The trial judge held that even though the court of law must be firm in its decisions, it must be fair to parties and when occasion demands, the court needs to also be humane. He then adjourned the case till March 14, 15 and 16, as pleaded by his counsel. Metuh was consequently wheeled out of the courtroom and placed in an ambulance which conveyed him to the court.